Located at the crossroads of Stamford’s rural and downtown areas, the Stamford Marriott Hotel & Spa will provide a unique location for your wedding photography session. Begin your wedding photo shoot on lawn in the hotel’s driveway, where your photographer can arrange a group photo of the entire bridal party. Afterward, venture inside the hotel and you’ll find yourself inside an elegant lobby. Here, your wedding photographer can snap some relaxed photos of the bridal party lounging on the chic, comfortable furniture. The bride and groom can also pose for a romantic portrait beneath one of the lobby’s beautiful hanging chandeliers. Having finished inside the lobby, head over to the hotel’s modern Night Lights Bar and Lounge, where your wedding photographer can organize a gentlemen’s shot or a girls-only photo with the groomsmen and bridesmaids staggered along the bar. 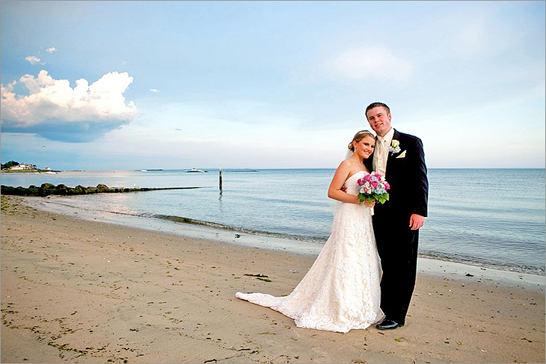 Once you’ve completed your photo shoot at the Stamford Marriot, take a short limousine ride over to Cove Island Park, located only a few miles away. One of the most popular recreational parks for Stamford locals, Cove Island Park has become a favorite spot for wedding photography. Have your wedding photographer assemble a group photo of the entire bridal party using the park’s glimmering stream as a backdrop. 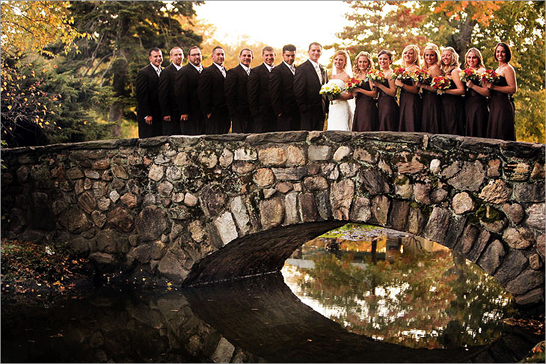 Your photographer can also arrange a group portrait on one of the park’s verdant lawns. Afterward, the bride and groom can pose for an intimate photo beneath one of the park’s tall shade trees or seated on one of the scattered benches. The magnificent Stamford City Hall, located in the heart of downtown Stamford, will provide the perfect location for your wedding photography session. Upon arrival, have your photographer assemble a group photo of the bridal party staggered along the building’s front steps. Your photographer can then have the bridal party pose for photos between Stamford City Hall’s towering Corinthian columns. Afterward, the bride and groom can pose for a private portrait beneath the ornate arched front entrance, beside one of the lamp posts, or near the flag pole. Finally, have the bridal party pose for a great group portrait with the beautiful Beaux-Arts style exterior as a backdrop. After you’ve finished at Stamford City Hall, take a short ride over to Stamford’s First Presbyterian Church, located just over a mile away. Here, your photographer can start off with some individual photos of the bride and groom at the two front entrance doors, separated by a thin, white cross. The bridal party can then get into position for a group portrait, spread out along the front marble steps. There is also a lush green lawn that runs contiguously alongside the perimeter of the church, where your photographer can set up some great group and individual photos, with the building’s stunning modernist architecture in the background. 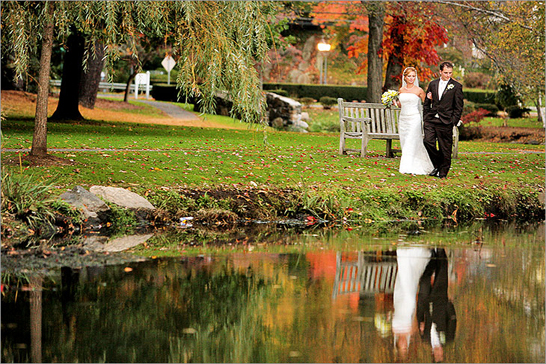 Finally, take a short drive over to Stamford’s Cummings Park, a perfect outdoor location to conclude your wedding photo shoot. In particular, the park’s spacious beach area will provide a scenic space for your wedding photographer to work with. Have your bridal party gather for a group portrait on the soft white sand, with the sparkling Westcott Cove as a backdrop. The bride and groom can also pose in the sand for a couple’s photo (for the sake of the wedding dress, you may want to bring a white sheet for the bride to stand on). Finally, your wedding photographer can arrange a romantic photo of the bride and groom out on the Cummings Park pier. Boasting 91 acres of botanical gardens and natural landscape, Stamford’s Bartlett Arboretum will provide a picturesque location for your wedding day photo shoot. Begin your photography session in front of the entrance sign, surrounded by diverse, colorful bushes. Afterward, head inside the arboretum grounds and take some photos near the Cottage Garden, whose shady garden area offers plenty of lush greenery and special flower collections that vary according to the season. As you venture deeper into the arboretum grounds, you’ll find expansive verdant lawns that will work well for group photos of the bridal party. The Bartlett Arboretum also features a unique collection of rare trees, including the massive Champion Trees, which will serve as striking backdrops for photos of the bride and groom. The arboretum’s one-of-a-kind Red Maple swamp area is also a great place for some photo-ops. As you explore this vibrant natural expanse with your bridal party, you’ll find numerous little benches and miniature bridges that will work well for both individual and group photos. You’ll have an amazing time during your wedding photography session at this Stamford gem!